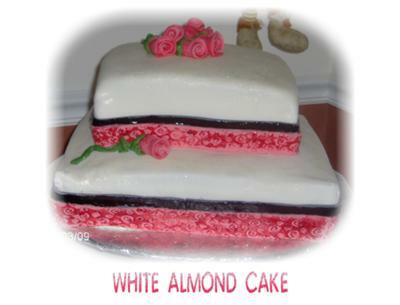 To make this wedding cake, I made two 12" square almond cakes and two 8" square almond cakes. I filled them both with almond buttercream and covered them in marshmallow fondant, with fondant pressed ribbon around the edges and a thin fondant edge to ribbon. I painted the ribbon with edible paint. I sprinkled pearl dust all over it to make it shine. I made the roses out of a strip of fondant, and just rolled them up.